Growing up I didn’t realize how eccentric and fun my great uncle Lyman was because we only saw him every other year for reunions. But in the past 5 years he has decided to retire around the corner from my grandparents and now I get to revel in all the joys and hilarities of the family patriarchs united again. Uncle Lyman is known for showing up for dinner with his own unique contributions, usually in the form of obscenely large watermelons, insane quantities of summer squash or melons, or large cuts of meat. Uncle Lyman loves fresh summer produce, and he loves to buy it from the local farmers. I don’t mean trendy farmer’s market style like me, I mean actually going to their farms (or the tiny Wilmore farmer’s market which is pretty much the same thing) and coming out with a bushel of beans. His favorite place to buy is what I like to call “Amish Land,” a cluster of Amish farms in past Preachersville Kentucky, aka, far after falling of the face of civilization. He and my grandmother trek out into the Kentucky hills and return with gorgeous produce. On Monday, my friend Rachel and I braved the trip with them. After flying around turns and winding our way through miles of green hills and picturesque farm houses, we finally pulled up at an Amish farm where Uncle Lyman comfortable ambled into their garage to await the children that would eventually notice us and come out to sell. Though it was early in the season, we left with our arms brimming with fresh honey (comb included! ), early zucchini and squash, and few greenhouse tomatoes. Oh, and Amish baked goods that did not last much past the car as well as a suspiciously cheesy block of Amish butter. Because I impulsively bought 6 squash (for 2$ — I know, wonderful), I decided I needed to make something with them promptly. That night Rachel and I completed our perfect summer day with a grilled pizza. If you have never made grilled pizza, I advise you to do so NOW. I have been converted to feel that pizza should always be grilled. We made a variation on this Smitten Kitchen recipe, and I give it to you, but with the grilling directions. Prepare dough according to box directions (like me) or according to whatever recipe you have. Spread a piece of parchment paper with cornmeal and roll out the dough onto the paper. Place pizza stone on grill and heat to 500+. You don’t want to do this until you are close to being ready to put the pizza out there or you will have the stone too hot, which will burn the bottom of the pizza and not cook the top. Conversely, having it not hot enough will leave you with soggy pizza. If done right however, you have delicious pizza quickly with no prebaking. Mix goat cheese, dashes of salt and pepper, and the juice of half of the lemon together. Spread on pizza dough. 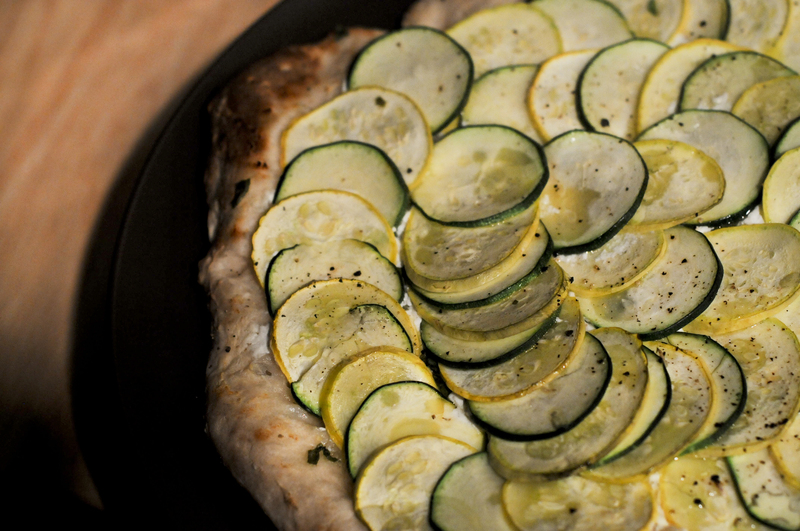 Sprinkle cheese with basil and then arrange veggie slices in concentric overlapping circles. You will probably have a couple slices left over, but I believe in putting as many veggies on there as you want. Smitten Kitchen recommended only half each of squash and zucchini, but that is not enough for me to justify eating bread covered in cheese and call it dinner. Also, I needed to use up my Amish produce. Squeeze the other half of lemon over veggies, drizzle with olive oil, and sprinkle with salt and pepper. Use a plate or cookie sheet to help transfer the parchment paper and pizza to the pizza stone. Close grill and cook for 5-10 minutes or until the edges of crust are golden and paper is beginning to singe at edges. This entry was posted in Uncategorized and tagged Cooking, food, summer, vegetables. Bookmark the permalink. 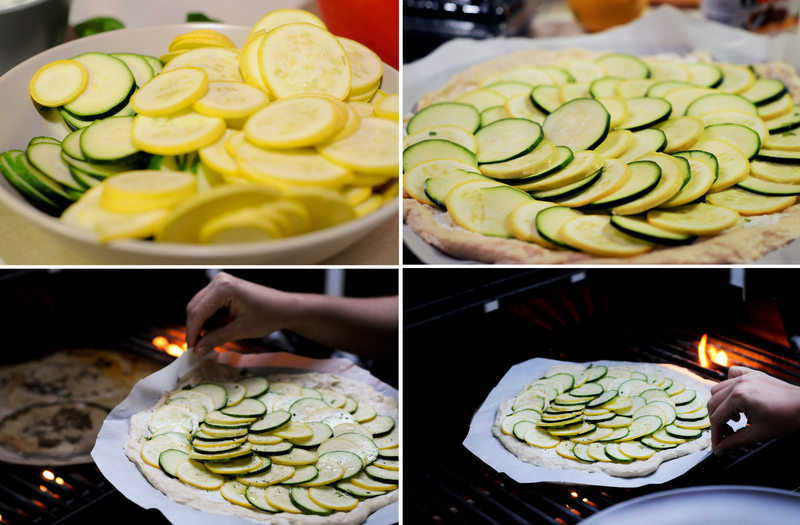 I promised I would follow up 🙂 http://dyingtoliveforhim.blogspot.com/2011/08/recipe-grilled-summer-squash-pizza-with.html Thank you for the idea! !